For those of us lucky enough to attend college, I think we can all agree that living in a college dormitory makes for one of the most unforgettable memories of our lives. Your dorm room is the reflection of who you are during the part of your life that molds you into where you will end up in life. For a student attending the University of Missouri-Columbia, teenagers and young adults have a wide variety of rooming conditions to choose from. You might want the community style dorm: sharing a room with another lucky, hormonal teenager with a bathing room down the hall used by everyone on that floor. Or you might consider a suite style dormitory where a couple rooms share one bathroom. As far as the kitchens are concerned, some dorms have one kitchen shared between everyone in the building, while other dorms have kitchens on each floor. Generally speaking, whichever dorm you choose, someone will make sure your bathroom and kitchen are in clean conditions, user friendly, and are fixed as soon as possible if broken. Although the sanitation of your room is left up to you, I can guarantee the furniture that is provided by the institution will be reliable and will serve you for as long as you’re there. But not everyone is as lucky as the college attendees of mid-Missouri. Due to the harsh dorm conditions of Russia, most Russian native students choose to live with their parents while others share apartments with friends. As I was researching the World Wide Web and trying to narrow down the information Google spewed out at me regarding the conditions of Russian university living accommodations, I ran across a very interesting website: www.sras.org. According to the home page they “specialize in study, research, and travel abroad to Russia and Eurasia” and they also “provide free info for students studying Russia and Eurasia” (JACKPOT!). So according to SRAS (The School of Russian and Asian Studies), the St. Petersburg State University has some pretty rough living conditions. The dorms are 45 minutes to an hour away from campus and the commute will involve “a bit of walking”. Internet is a paid service and is only available in some dorm rooms and the website clearly states “this is not always reliable” and offers a guide for alternatives to St. Petersburs State University’s unpredictable internet. For the lucky few, a television might be provided in their room (wonder what century that came from) and overall “conditions are livable, but they are not particularly well cared for”. According to this same website, the Moscow state university offers many options for living, mostly off campus. The only dormitory on campus provides you with your own room which includes a bed, desk, and wardrobe (all dated back to the Soviet Union times) with a shared entryway, toilet, and shower (also all original versions from the Soviet times). Here, kitchens are shared with the rest of the residents on the floor and do not always have functional refrigerators. And to top it all off, good luck meeting with friends for a midnight snack or a late night pity party! Guests have enforced restricted hours and each one must obtain a special pass consented by a resident. But surprisingly, the dorms do not have “lockdown hours” (curfew) like most other Russian universities! 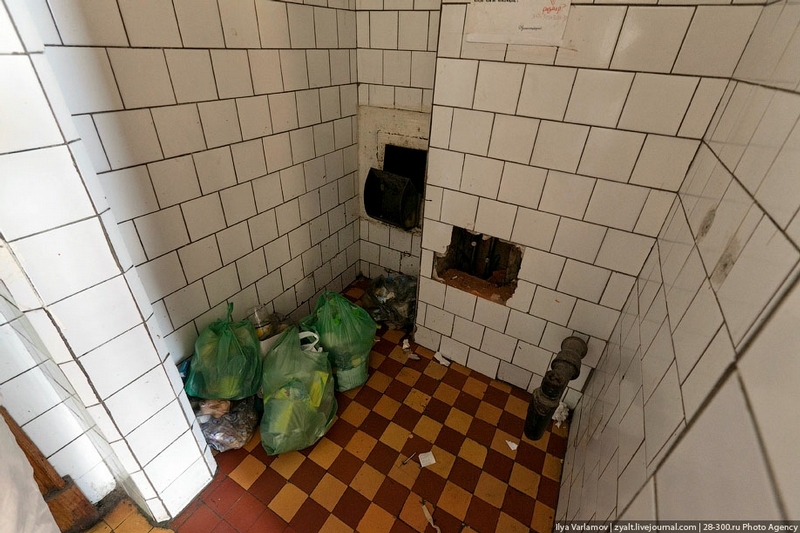 I know I promised I wouldn’t post any more pictures of disturbing bathrooms, but Via Zyalt did a very thorough job of documenting the life of an average Russian at the Moscow University and I just felt like I absolutely had to share one of his pictures. He posted the following picture with the caption: “The restroom is one of the issues that bother students. The point is that there are just two restrooms on each floor and sometimes, a cleaning woman does not appear for days”. For pictures of black mold that never leaves and always comes back even if you soak the entire building in bleach, click the photo above and it will take you to Via Zyalt’s article. So now, we see that the living environment is clearly not the best, but what does the university do? According to the same article, absolutely nothing. The university is spending thousands and thousands on re-building their library and main buildings, but absolutely nothing to make the students’ home away from home any more welcoming than it is at this point. So how do students survive in such awful conditions? And if the dorms are a reflection of our youth’s life and where they are going in life, then what does that say about Russians? And why is no one doing anything about this? This entry was posted in Russia and tagged dorm, dormitory, life, studying abroad, university, youth. Really good article. Well stated, informative, interesting, and sprinkled with an opinionated point-of-view throughout. I wasn’t quite sure what to think of at the beginning due in part to the title (it would have better attracted my attention if you wrote something disgusting and bathroom related 😀 ), but that reluctance of course faded away quite quickly. The dichotomy, or rather the representation you formulated between MU and Russia is nice. I like that compare and contrast element — it either makes us think a bit more critically in America, or at the very least allows us to be thankful to be living in fairly mold-free and caring environments!